Join us for our March monthly volunteer event! 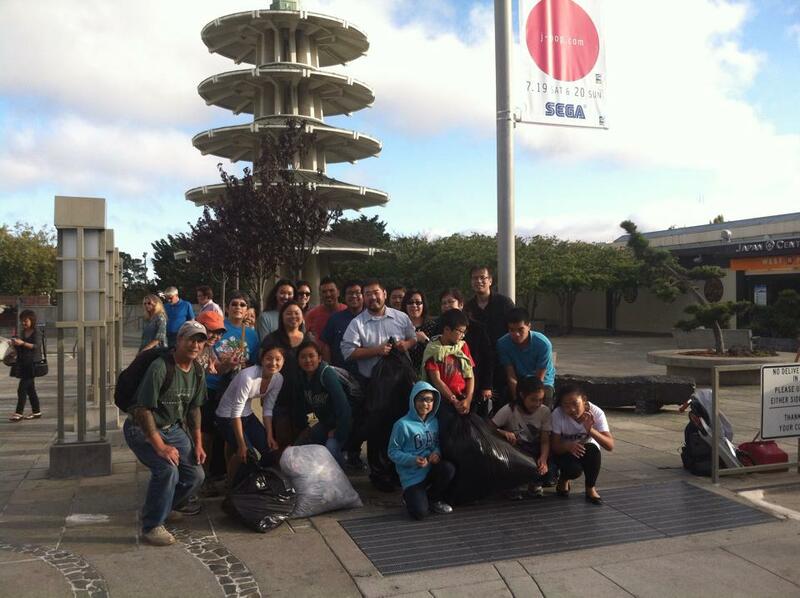 With the Cherry Blossom Festival just around the corner, Nakayoshi is teaming up with the Japantown Task Force and SF Department of Public Works to clean up the streets of Japantown on Saturday, March 28, from 10am-Noon. Join us in helping keep our community looking great! We’ll meet up at Peace Plaza at 10am and have a well-deserved lunch in Jtown following the cleanup. Gloves and other cleaning supplies will be provided, but feel free to bring any other supplies you may have. Questions? Feel free to e-mail us at nakayoshi.ncwnp@gmail.com. For those of you who are also available on the April 4th, an additional community cleanup day hosted by the Japanese Community Youth Council (JCYC) also needs additional volunteers. 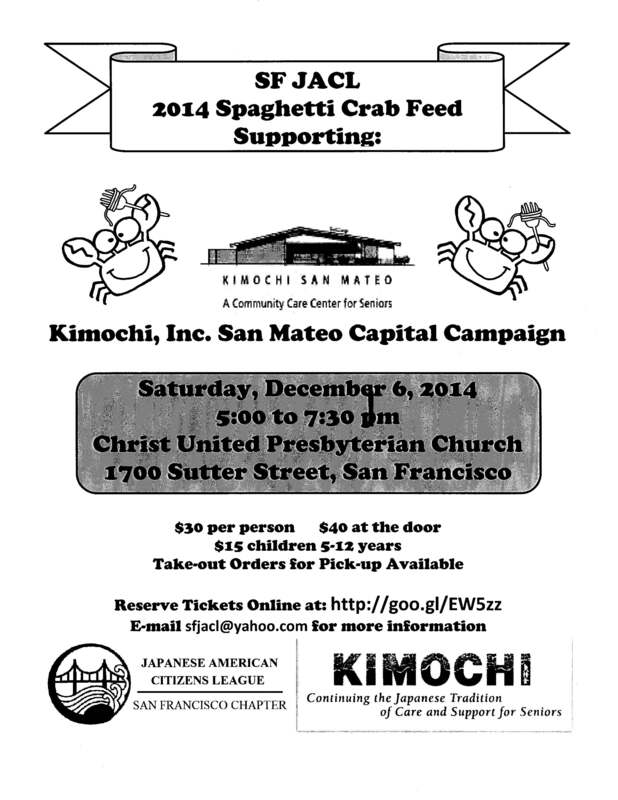 Join us as we help out the San Francisco JACL chapter at their annual spaghetti crab feed benefit dinner, Saturday December 6, 2014 in SF Japantown! Proceeds from this year’s dinner will go to support Kimochi, Inc.’s San Mateo Capital Campaign, raising funds to support the newly opened Kimochi Community Care Center in San Mateo for Senior Citizens. Dine-In and Take-Out tickets available. Volunteers are advised to bring hats/hair coverings and aprons if handling food. This month’s social will be on Saturday, November 8 down in San Jose! We’ll start with a daytime visit to the Japanese American Museum of San Jose in San Jose Japantown, then head over for dinner and more hanging out for the evening in San Jose’s San Pedro Square District. 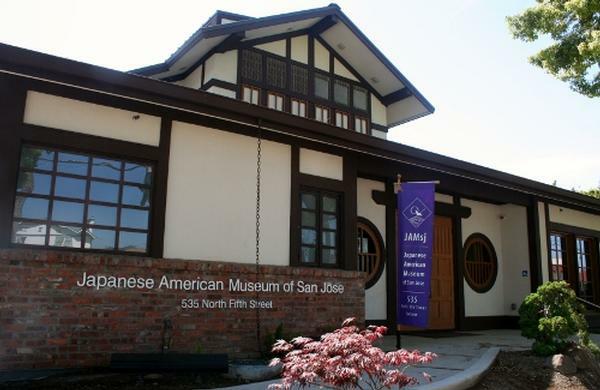 We’ll start with a guided tour of the museum and exhibits at 2pm ($5 admission) and, also check out the JAMsj Winter Boutique down the street at the San Jose Buddhist Temple Betsuin and spend some time perusing San Jose Japantown. We’ll regroup in the evening at San Pedro Square at the San Pedro Square Market to have dinner and hang out in the area for the rest of the evening. Please feel free to join us at night, even if you aren’t able to make the museum tour during the day! Hope to see a lot of folks from the Peninsula and South Bay come out! Questions? E-mail us at nakayochi[dot]ncwnp[at]gmail[dot]com For more information on JAMsj or San Pedro Square, go to: http://jamsj.org/ and http://www.sanpedrosquaremarket.com/ Physical Addresses: JAMsj 535 North Fifth Street · San Jose, CA 95112 | San Pedro Square Market 87 N. San Pedro St, San Jose, Ca 95110 See you soon! Sake Fest Time! 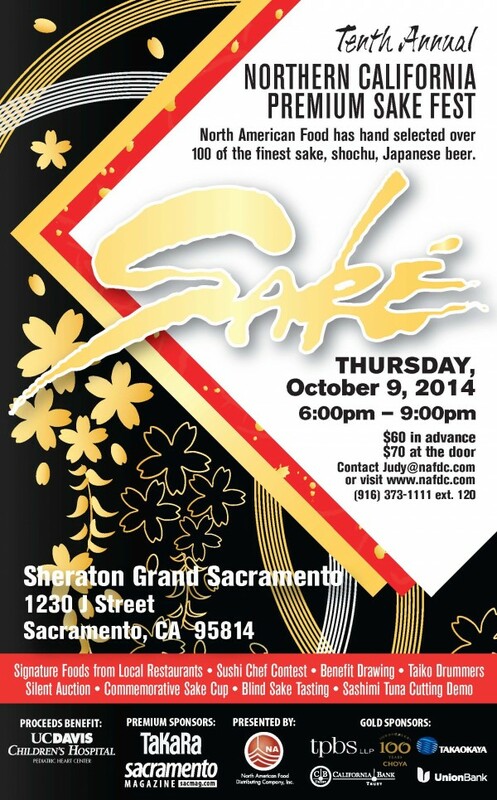 Save the date, Thursday, October 9, 2014 from 6pm to 9pm at the Sheraton Grand in Sacramento, and join us for our 10th Anniversary Celebration! We have fun things planned as well as great sake, beer, and shochu. Watch in amazement as a chef carves a whole tuna for sashimi, the best you will ever taste! Taiko, festival dancing, sushi, izakaya bites, and much more! For those of you going from the bay area and need a place to stay, let me (Graig Inaba) know at gnab4lfe[at]gmail[dot]com. Hope to see you there! Hey Nakayoshis! 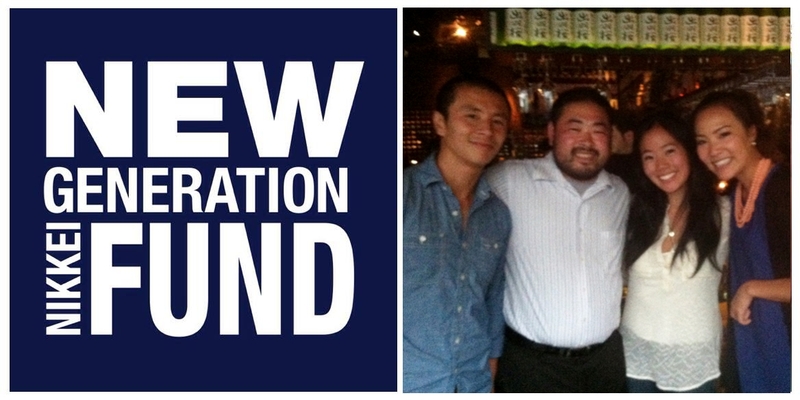 Our social event for July is an exciting launch event happy hour for the New Generation Nikkei Fund (NGNF), a brand new statewide philanthropy group started in part by several Nakayoshi members and other young professionals representing San Francisco, San Jose and Los Angeles’ Japantown communities! Introducing the New Generation Nikkei Fund: Creating a new generation of philanthropists to support our Japantowns! Join us for happy hour at Ozumo restaurant in downtown San Francisco on Tuesday, July 22, 2014 from 5-7pm to celebrate the launch of the New Generation Nikkei Fund in San Francisco! Looking for a quick, easy way to do some good and make an impact in your community? 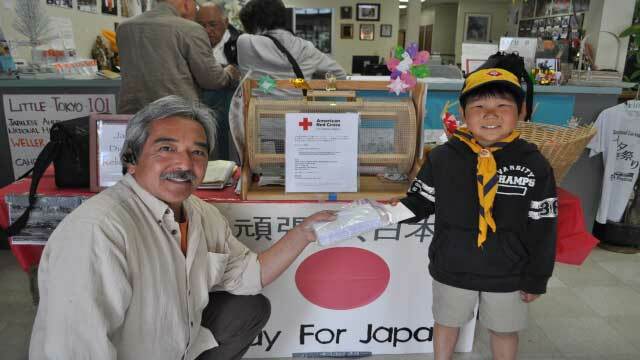 NGNF is all about connecting community non-profit organizations serving our Japantown communities with the next generation of community supporters. 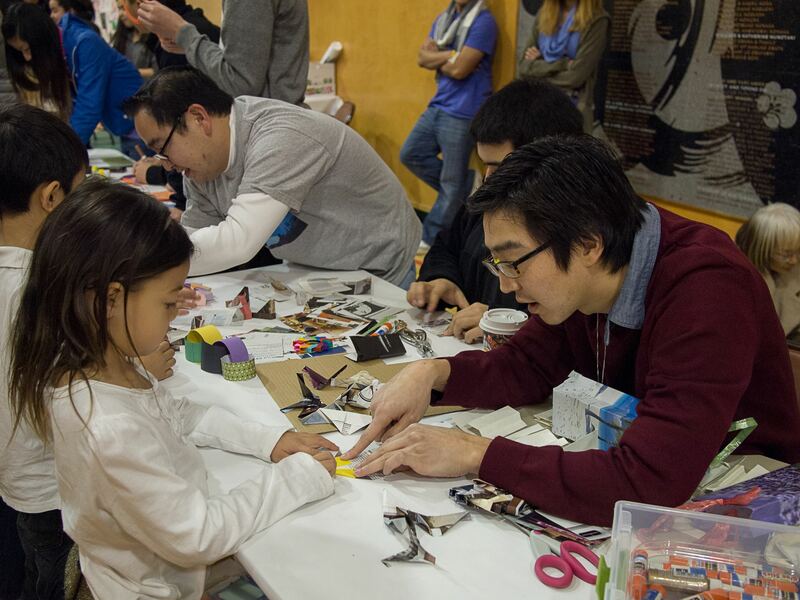 Come find out how with a minimum donation of $25, you can make the deciding votes to fund programs and non-profit organizations that serve San Francisco’s Japantown. 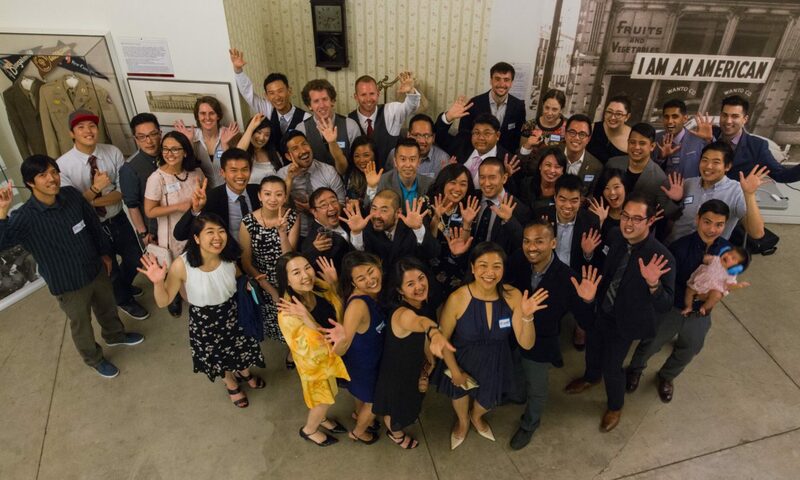 We’ll be hosting a happy hour where you can meet our committee and learn how to join our statewide movement to support the future of our San Francisco and San Jose Japantown and Los Angeles Little Tokyo communities, all while enjoying appetizers and drinks and mingling with other NGNF donors. The happy hour has also been made possible with the support of Nakayoshi Young Professionals. We’ll be taking pictures of NGNF Donors (old and new) holding our NGNF Donor Cards, so make sure you come dressed sharp! While the happy hour launch is free to attend and open to anyone interesed, a suggested donation of $25 (making you an official NGNF Donor!) can be prepaid via the purchase of a happy hour event ticket on Eventbrite or given at the door (cash or credit card preferred). All current donors who have already given get in free as well! Questions? Contact us at ngnf.donors@gmail.com. Be sure to “Like” NGNF’s page on Facebook! 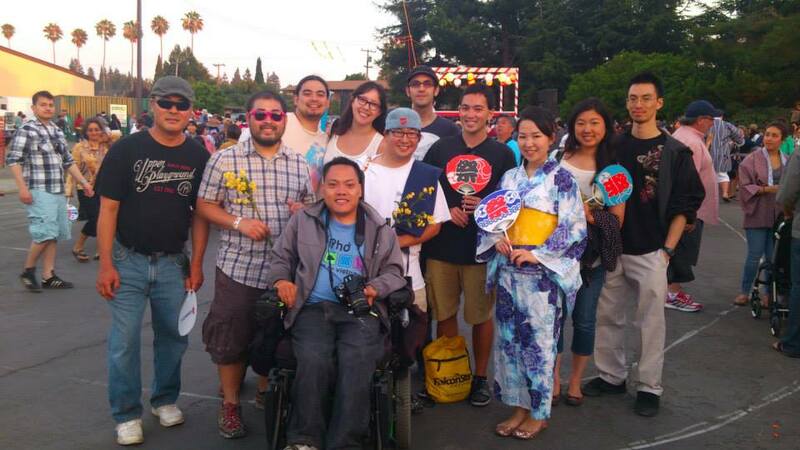 Hey Nakayoshi, obon season is about to get started, and we’ll be helping out once again at the Mountain View Buddhist Temple’s Obon and Bazaar on Sunday, July 20. Please see the links below to sign up for the various shifts. 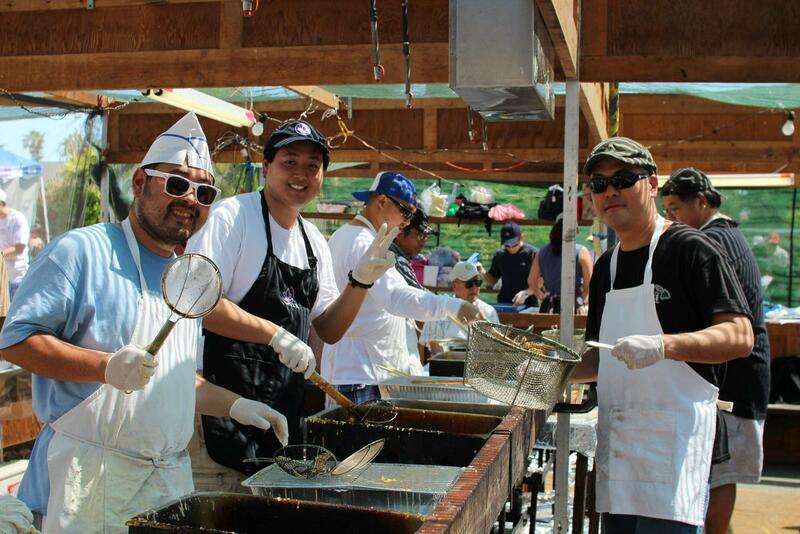 There are also shifts available to help set up and prepare food during the week prior to the obon for those of you in the South Bay. We hope you can join us for a fun day of volunteering and sampling all the great food and game booths, followed by traditional obon dancing at the end of the day! Popular booths that Nakayoshi has helped with in the past include the chicken teriyaki booth and tempura booths. Please remember to bring hats and or aprons (optional) for any volunteer shifts involving the handling of food. As many volunteers as we can get are needed for the pre-bazaar activities including construction of booths and preparation of food stuffs (like manju making and vegetables and beef preparations). Many booths are short of help and need volunteers on bazaar week-end, July 19th and 20th. Please signup for as many shifts as you can. Following the bazaar week-end we still need help for the post-bazaar deconstruction and cleanup. Come and join us next Thursday evening, 4/3/14, at 7pm at the Yerba Buena Ice Skating & Bowling Center in Downtown San Francisco! The center is located behind Metron – walking distance from Powell MUNI/Bart station. Parking is also available at the Fifth & Mission Parking lot. We have reserved 4 lanes – just enough for max 20 people. If we have more attendees, we’ll do our best to arrange additional lanes, but not guaranteed. The cost will be split up with the number of attendees, starting at $22.00 per person. This includes the 2 hour bowling session & bowling shoe rental. PLEASE RSVP by Sunday 3/30/14 to guarantee a spot! Feel free to contact Natsumi Inoue at nakayoshi.ncwnp@gmail.com. Thanks all! Looking forward to seeing you there! Join Nakayoshi at the San Francisco premire of “Stories from Tohoku” at the annual CAAMfest 2014! Please contact Natsumi Inoue at npinoue@gmail.com to reserve a ticket (possibly with a group discount if we get a group of 6 for $60 deal!). Otherwise, tickets are available now if you’d like to make your own arrangements and meet with us at the venue! Please let us know if you have any questions and see you at the movie! Nakayoshi MiniMeetups is our new monthly program for people looking to meet and get to know other members of Nakayoshi better in a casual and fun setting that is flexible for everyone’s schedules. MiniMeetups places you in a different small group of 4 Nakayoshi members every month. It’s up to your group to decide when and where to meet, and what fun activity you guys will be doing! 1. Fill out our one-time online signup form with your contact information and preferred meeting location. 2. Every month, we’ll put you into a group of 4 Nakayoshi members to form your monthly Nakayoshi Mini-Meetup group and send you an e-mail with your other group members’ contact information. 3. At that point, it’s up to your Nakayoshi Mini-Meetup group to contact each other to decide when and where to meet, and what fun activity you guys will be doing! It can be as simple as grabbing a bite and hanging out, cooking a group dinner, going to a movie, or whatever else your group decides to do. It’s completely up to you guys! 4. We’ll continue assigning new groups of 4 every month as new Nakayoshi Mini-Meetup group members sign up to participate. Signups are starting this month! We will be starting our first round of MiniMeetups in February! Click here to sign up for Nakayoshi MiniMeetups! Akemashite Omedetou! Happy New Year! Join us at our first event of 2014 as we volunteer with the SF JACL Chapter at the annual Oshogatsu Festival at the JCCCNC! We’ll be helping at the kids’ arts and crafts table as well as helping with set up and cleanup. Every year, the festival features free arts and crafts activities for children, mochitsuki (Japanese rice pounding), ozoni (traditional Japanese New Year’s soup), food, children’s art contests and performances, and other entertainment. Join us for our annual celebration of the new year with the rest of the community!